Yoga. Prayer. Celebration. Faith services for all. Visit the Hubbard Interfaith Sanctuary. 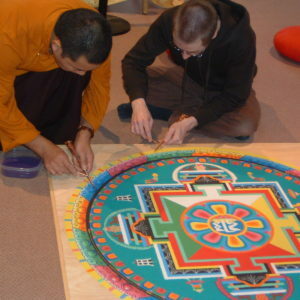 Lama Karma Chopal makes a mandala in 2010 at Saint Rose. A Buddhist Sand Mandala of Compassion will be created by Lama Karma Chopal October 22-26, 2018. 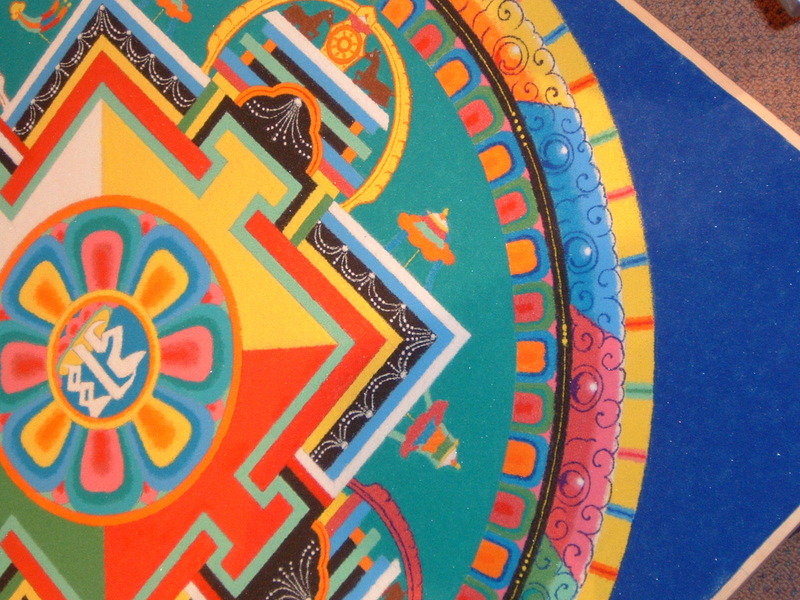 Work on the Mandala may be witnessed Monday (Oct. 22) – Friday (Oct. 26) from 9:00-11:30 am and from 2:00-5:00 pm. Revered Tibetan Buddhist Lama Karma Chopal will be at Saint Rose’s Hubbard Interfaith Sanctuary October 22nd -26th, 2018 to construct a mandala, a sacred sand painting. The specific mandala being created is the Mandala of Compassion. A historical Buddhist tradition, a mandala (“circle” in Sanskrit) is a cosmic map of the universe meant to guide individuals to enlightenment. In recent times, monks have begun creating mandalas at community centers and campuses as a way to increase compassion and to bless the community. 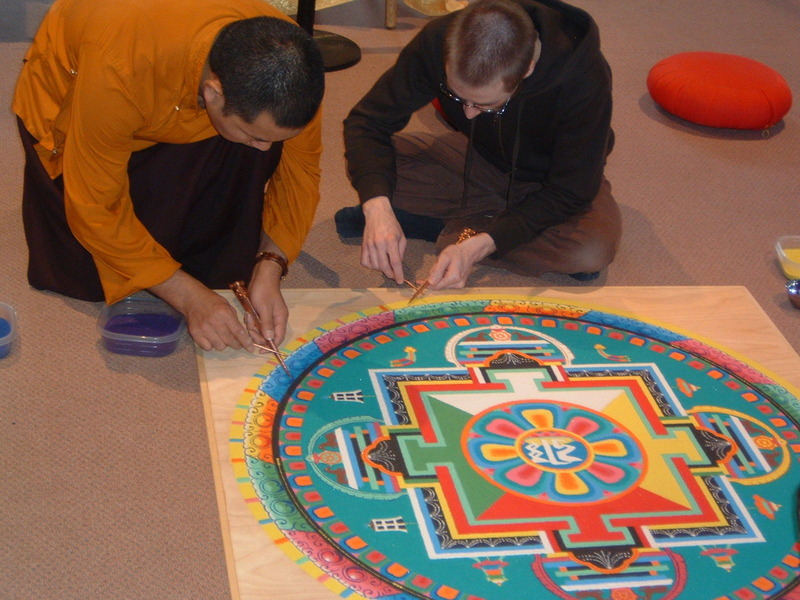 Lama Karma Chopal last created a mandala at the College of Saint Rose in 2010. Making the mandala involves dozens of hours of carefully placing multicolored sand in an intricate, bright pattern on a horizontal surface. The result is a breathtaking work of art. The mandala is then swept up and poured into a flowing body of water, embodying the central Buddhist theme of impermanence and symbolizing the transitory nature of life expressed in many faiths (“All are from the dust, and to dust all return,” Eccles. 3:20). Fewer than 100 artists worldwide are qualified to create true mandalas, according to the Venerable Losang Samten, who made the first public sand mandala in the West. Lama Karma Chopal, a Tibetan national who became a monk at age 11, studied Buddhist art with renowned artist Sonam Nyima for a decade, and completed his monastic training in India and Nepal, came to the United States in 2001. The community will commemorate this rare occasion with a week of events celebrating Eastern traditions and culture, including an introduction to Buddhism, an Introduction to Dharma Art; and two musical events – a performance of cello music by Professor David Bebe and an evening of Buddhist Kirtan and Chant by Lee Mirabai Harrington. 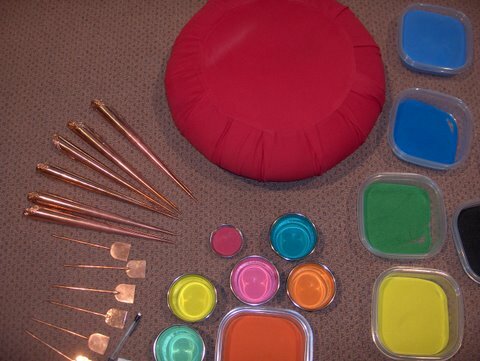 In addition the Student Art League will lead us in creating our own mandalas. We can read about poverty. We can study poverty. We can talk about poverty but here is a chance to get inside of the experience of those living below the poverty line. All are welcome to attend this opportunity to get inside the lives of the men, women, children and senior citizens who fight to make ends meet. This is an exceptional opportunity for those going into careers in business, in education, in social work and any career field where you will be working with people who are fighting economic challenges on a daily basis. Certificates will be available for those who participate and a number of faculty will be offering course credit. Years of past student participants have validated the life-changing nature of this program and what it had to offer them for their future careers and academic pursuits. A few hours of your time will have a huge impact on your life. Mindfulness meditation and relaxation: Wednesdays at 3:00pm in the Sanctuary. Yoga class: Tuesdays at 1:15pm and 7:00pm in the Sanctuary. Classes are free. All levels are welcome to attend. Opportunities for Prayer: Hubbard Interfaith Sanctuary is open for quiet prayer and reflection from 8:00am – 10:00pm, Monday thru Thursday and 8:00am – 5:00pm Friday, Saturday and Sunday. 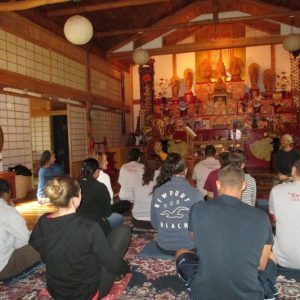 Better Together –This student organization for those from all faith traditions and belief systems, creates a safe space to communicate with others who think differently in a “no judgment zone”. We offer support to the many ways people explore spiritual paths and engage in service as a common ground. Through this, we learn about each other and about ourselves. Meeting time: Mondays at 8:00pm in the Hubbard Interfaith Sanctuary. Catholic Student Organization – welcomes students of Catholic faith for conversation, prayer, and service. Meeting time: Sundays at 4:15 pm in the Hubbard Interfaith Sanctuary. BASIC – Brothers and Sisters in Christ – Christian student organization sponsored through the Student Association. Meeting time: Thursdays at 6 pm in the Hubbard Interfaith Sanctuary. Reach Out Saint Rose is an amazing tradition at the College, when 900+ Saint Rose students, staff, alumni, family and friends go out into the community and make a difference with a few hours of time and energy. A little bit of our time supports neighborhoods, nursing homes, shelters, community gardens and local social service organizations that do so much to respond to the needs of the people of the Capital Region. Follow this link to learn more and to sign up for this amazing program!